To decide which mirror you need, a number of factors are important. The right type of mirror is dependent on the application. For instance, an outdoor mirror should have as little condensation or frost as possible. In the food sector, it is crucial for safety reasons that a mirror does not break. Each application has its own mirror with specific material properties. A rule of thumb is that the distance from the viewer to the mirror determines the size. Of course, the application is important in this as well, sometimes a smaller mirror suffices, or it may be better to use a larger one. 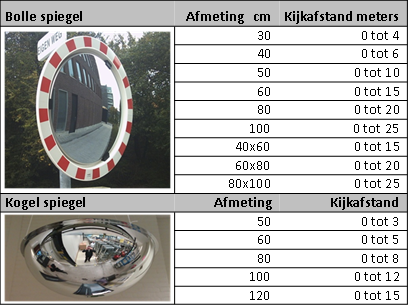 You can find the size of the mirror you need in the distance-table below. Depending on curvature, larger viewing angles are possible. We would like to mention however, that the larger the curvature of the mirror, the more the mirror will reduce the image. The material of the mirror often depends on the application. Like vandalism, food / non-food, indoor or outdoor use.